This year we are planning a Christmas evening of worship entitled, “The Light of Christmas” directed by Ken & Kathy Drake and Brian & Sherry Barron. The evening will unfold with a beautiful weaving of Scripture, music, drama, and worship, ending with a dessert reception fellowship. During this Christmas season, we desire to encourage believers and seekers to experience the depth of God’s Word, His saving grace, and His gift of eternal light through this intertwining of: special music including violinist, cellist, soloist, small ensemble, children's voices, music by Ken & Kathy Drake, and an original drama created by Sherry & Brian Barron. 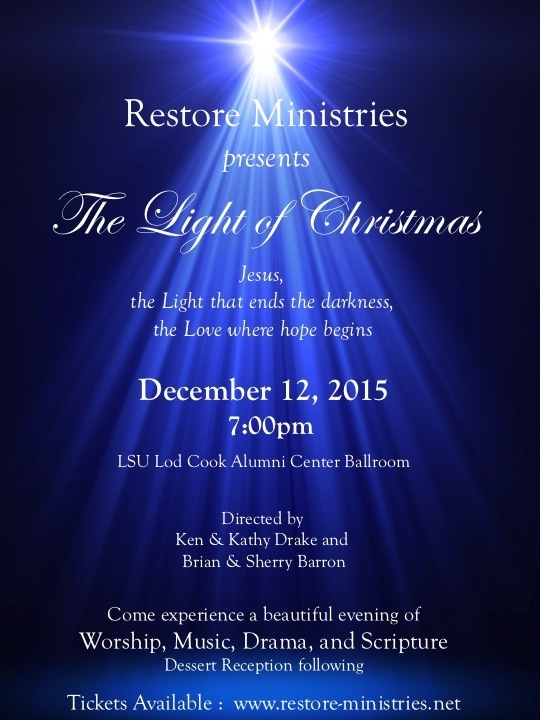 Please join us for a beautiful evening of worship! This event is open to everyone with a dessert reception following. Please note that a nursery is not available. ​ Early Bird rate remains!